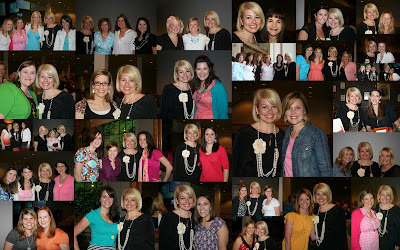 These are some of the amazing bloggers and people I met on Saturday. I wish I could just post each picture and tell you about them all but that would take days to read! And I didn't get pictures with all of them and I hate it. I was so overwhelmed to meet so many sweet people and I spent a lot of the day very "insecure". I wanted to start this blog by saying "It was pouring rain and humid and I was having the WORST hair day and my face broke out for the first time in years and ..........." but I just spent a day learning how insecurity is really the worst form of PRIDE. And how if we could just quit obsessing about ourselves and be a secure woman......we could forgive others and think of others first and serve others and in turn - show the love of God! I want that more than anything. But it's still hard not to be insecure when you are in a building with 9000 amazing women. (There were over 300,000 women watching over simulcast. I hope that's 300,000 women who WON'T feel insecure and will help their daughters and granddaughters NOT to feel insecure)! Were you watching on simulcast??? Probably my favorite thing was the praise and worship and to hear 9000 women singing "The Revelation song" - it sounded just like heaven will to me. Or to hear us just sing old hymns. 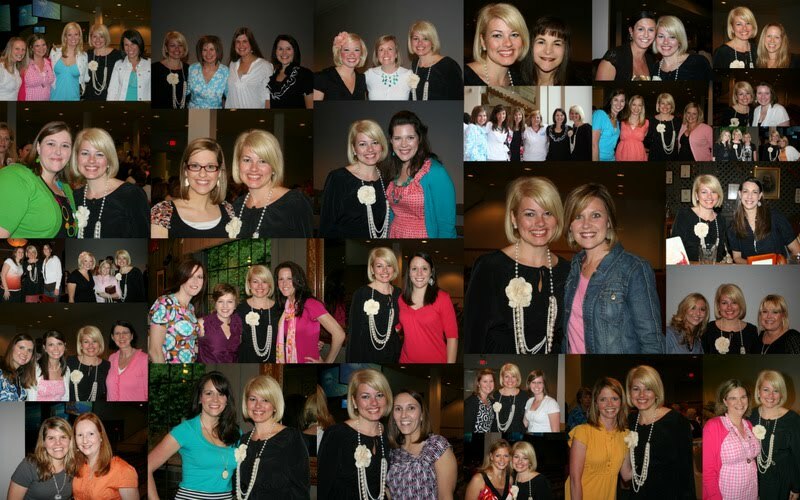 I was overcome to be so blessed to be surrounded by women who love Jesus as much as I do. I was so blessed to spend the day with two of my very best friends, two of my bridesmaids, two girls I KNOW will be my friends when I am 65 and gray headed (wait I already am gray headed). ha! Laurie and Hillary make me laugh more than anyone on earth. And these two girls are two of my blog friends from way back. We have e-mailed and talked and kept up for a long time. And they are both CUTE AS BUTTONS and SINGLE! I know all you blog readers have cute sons, brothers, friends..............you need to hook these girls up! And Faith has been my blog friend for an equally long time. And I have prayed for her and Chad for so long and I have so much hope that God is going to bless them immensely. I was honored to meet her this weekend and spend time with her. I don't have a picture of me and my friend Mandi on here for some reason but she is one of the sweetest people I have EVER met and I was thrilled to meet someone who I have prayed for also! After the conference we went to Copelands and ate dinner. We had a great time. Jill, Joy and their mom ate with us! I enjoyed meeting them so much! Terri is a sweet girl who went to OBU and lives in Atlanta. She came and met us for dinner. She and Jennifer were friends at OBU. Terri is seriously one of the cutest girls I've ever seen. We were SOOOOOOO tired after dinner. I wanted to visit with EVERYONE but I couldn't seem to even move. Hillary, Amanda, Laurie and I kept talking and talking in our room. We kept meaning to go visit all other girls and then we would get going on another subject and before we knew it it was way past our bedtime. We got up early the next morning and flew home. But not before one last picture at the airport. All 5 of us had one thing on our mind when we landed in Branson - Cantina Laredo. I was ready for some guacamole. Here are Amanda, Hillary and Laurie. I'm surprised Laurie was even in this picture because she was so busy eating like 20 bowls of salsa while we were there. Amanda is one of the funniest people I know. She made me laugh SO hard this weekend. I was so glad she went with us! Me and Jennifer. She is one of my new favorite people. She just constantly cracks me up! I was SO happy she went with us! It was so fun to have a girls weekend away. Girls trips are one of my favorite things in the world. There is just nothing better than time with your girlfriends and I think as moms - we really need a little time of refreshment. But I missed my family SO much!!!! And I was never happier than this morning when my mom brought Harper back to me. (Except for the fact that Harper screamed and cried and CLUNG to my mother and wanted nothing to do with me. Talk about "insecurity" as a mom. She finally remembered she loved me after my mother left. And all is right in the world once again. Do you think maybe her grandparents spoiled her?) Thank you mom and dad for keeping Harper for me. I knew she was in the BEST hands and I was so thankful to get to go on this trip! Well - I have still only read a few chapters out of "So Long Insecurity" and I need to go finish it while it is fresh on my mind. We should ALL read it! Unless you don't deal with insecurity..................and if you don't...........well - that makes me insecure. ha! (And I have to add this........I've been trying to find a way to explain this to my friends and those close to me all weekend............I got to meet so many bloggers but it was VERY awkward and uncomfortable for me because I feel like God has given me this blog as a ministry. I pray every day to let me shine HIS love that others would be drawn to Him. I HATE attention on myself. The thing is - if you are drawn to me at all............it's more than likely it's because you are drawn to my love for Jesus. And it's very humbling to me for people to want to meet me because I'm nothing special.....but HE is. I have NO desire to be a blog celebrity. But being given a platform to share my faith IS a very unique and amazing thing and I will do my best because Jesus is EVERYTHING to me and all that really matters. But I pray it always stays a LOT more about God than it does about me.) (I even pray it's more about God than about how cute Harper is. Even though I think she is pretty cute.) ha!